Here are some of the more noteworthy things available in Eclipse Helios for PHP Developers (June 23, 2010) which is now available for download. See the build notes for details about bugs fixed and other changes. New Templated Content Assist Applying Content Assist proposals to the editor creates a templated expression that provides argument completion according to the declaration of the method. Optional arguments are left out of the template. 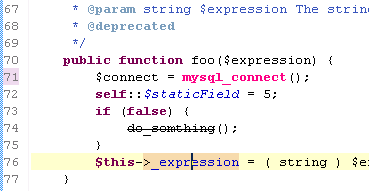 This feature helps developers to quickly edit their method parameters. 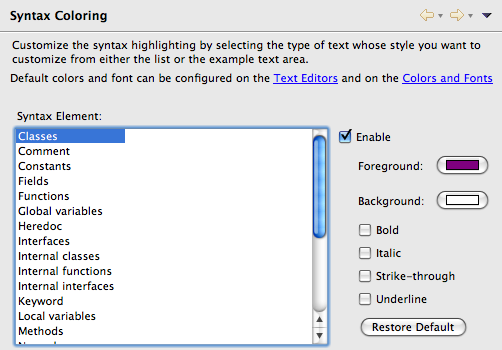 New Syntax Coloring Scheme Editor Reset the Syntax Coloring Scheme editor for PHP content. People are accustomed to the plain style usually provided by Eclipse projects. In this release, PDT is aligned with all other Eclipse standards. 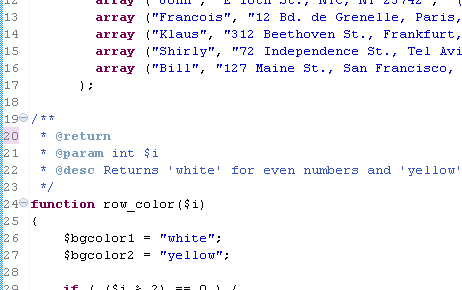 New Advanced Syntax Coloring Rules Several rules are configurable through Preferences > PHP > Editor > Syntax Coloring: A full list of rules is available here. New show inherited members in quick outline view Quick outline includes a "show inherited members" mode which lists all methods inherited by super types. New More Decorative Hover Information Richer information is now provided in the Hover Information tool-tip for methods, types and other elements. New Powerful PHP Search Dialog Enables a powerful PHP search of elements such as types, methods, and references/declarations. This is useful when reviewing code or for any type of browsing task. New Eclipse Marketplace An Eclipse-based Marketplace is a feature that provides a nice interface for http://marketplace.eclipse.org/. Eclipse Marketplace offers the Eclipse community a convenient, information-rich portal that helps software developers find open source and commerical plugins. Linux users can now use WebKitGTK+ instead of Mozilla as the Browser control's native renderer. See Can the Browser use the WebKit renderer on GTK?. Quick Access now shows keybindings for commands Quick Access (Ctrl+3) now shows keybindings for commands so you can save yourself from all that typing and just use the keyboard shortcut the next time you need to run a command. Closer items on top: If the pattern matches many files with the same name, the files that are closer to the currently edited or selected resource are shown on top of the matching items list. Apply patch in Synchronize view preference Thanks to the new preference Apply patch in Synchronize view, you can leverage the new way of working with patches each time you apply one. 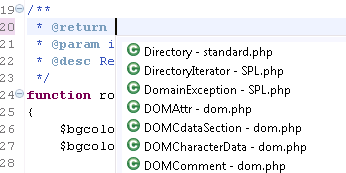 When set, applying a patch via the Team context menu or by pasting in Package Explorer uses the Synchronize view. Ignore Leading Path Segments option A new option helps apply patches with non-matching paths in the Synchronize view. This is the last option needed to bring patching in the Synchronize view up to par with the Apply Patch dialog. Warning about possible inaccuracy in comparison result The compare framework caps the result accuracy for large files. This used to happen silently, which confused users. Now when the faster algorithm is used a warning label appears. Enhanced Open in Compare editor menu The context menu of the Compare editor contains Open and Open With actions, which open the file in full-fledged editors. Now, these actions set the selection and the caret position in the newly opened editor based on the selection in Compare Editor. File system import wizard The file system import wizard now supports creating virtual folders and linked files and folders. Linked files and folders can also be created relative to a path variable.